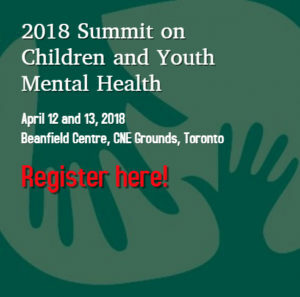 The theme of the 2018 Summit is Beyond Collaboration: Towards Integrated Systems for Supporting Child and Youth Mental Health. Presentations will focus on working across tiered systems of support for promotion, prevention and intervention. The Summit is designed to provide materials, resources, practices, protocols and programs that can be replicated and scaled up in communities across the province. There will be dynamic, interactive presentations that will illustrate collaborative and innovative approaches that are research based and evidence informed that are making a difference in the lives of children, youth and their families. Similar to the previous Summits, Thursday April 12, 2018 is the pre-Summit with half day intensive sessions and the main Summit begins on the Thursday night and all day on Friday April 13, 2018 with sessions highlighting exemplary, evidence based practice. There is a special pre-summit designed by School Mental Health Assist for principals/school administrators as well as a Ontario Centre of Excellence pre-summit workshop on early years mental health and Mark Greenberg our Friday key note speaker is providing a rare opportunity for an intensive pre-Summit session.